If you are looking for Chrysler dealers near Smyrna, Georgia we invite you to visit our Chrysler dealership. We offer the full lineup of new Chrysler models including Chrylser 300 sedans and Pacifica minivans for sale or lease. See our new vehicle inventory online and compare MSRP, color options, trim levels, MPG and vehicle details. Factory incentives, lease specials and Chrysler special offers are usually available. Our Chrysler financing and leasing team can help you take advantage of these specials so you are sure to get the very best price. Beyond our beautiful selection of new Chrysler cars and SUVs, we also offer quality Used Cars including economy cars, family vehicles, Used SUVs and Used Trucks from a variety of manufacturers. We have plenty of pre-owned Chryslers to choose from many of which are certified used Chrysler models. These low mileage vehicles are backed by extended factory warranties and offered at remarkable prices. Perhaps you are searching for expert Chrysler Service and repair. If so bring your vehicle to our auto service center. Chrysler vehicles are our specialty, we will perform flawless maintenance such as oil changes, tune ups, brake inspections and wheel alignments as well as more extensive auto repair. Our certified technicians understand your vehicle and use genuine Chrysler parts to keep your car or SUV running perfectly. 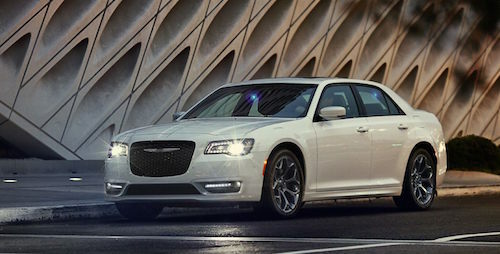 Why not stop by our Chrysler dealer near Smyrna, GA? Our Chrysler experts will take excellent care of you and your vehicle.